AMJ Pacific Co. is a Portland, Oregon based company that manufactures their hats in the U.S.A. Most styles are affordable, including the "Jones cap" style hunting hat that is the subject of this review. Unlike many cheap hats, AMJ Pacific products have served me well for many years, and I consider them to be an excellent value. 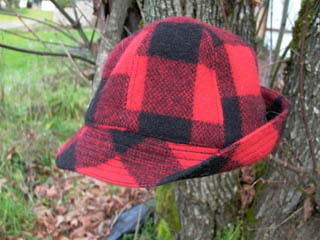 This traditional red and black plaid hunting cap is a good choice in cool weather. The semi-rigid front bill shades the eyes from sun, rain or snow, while the rest of the brim is soft and can be rolled down over the ears to form a "bucket" hat shape as required. For further increased warmth and protection from the elements, part of the inner lining can be pulled down to completely cover the ears and upper back of the neck. This hat does its job in rain or snow. The cap is made from what appears to be a wool blend and keeps the head warm even when wet. The inner hatband is some sort of heavy synthetic cloth, and the pull down ear/neck flap is an insulated synthetic fabric. The inner lining is a synthetic material, nylon or something similar, and is also lightly insulated. The crown of the cap is stitched together from six pieces of material, and the brim is stitched to the crown. This stitching is doubled along all seams and quite sturdy. I particularly like red and black plaid outerwear for big game hunting, as it is visible to other hunters yet difficult for deer and most other big game to see. Most game animals are colorblind and the plaid breaks up the garment's outline and blends into the surrounding woods. Photograph traditional red and black plaid outerwear garments in black and white sometime and you will find that they are effective woodland camouflage. I purchased my cap for under $10 (on sale) during the 2004 hunting season at a local Bi-Mart discount department store. I wore it deer hunting the next day, and two of my hunting buddies (both Guns and Shooting Online contributors) were so impressed by the quality, utility, and price of this cap that the following day they went to a Bi-Mart store and purchased identical hunting caps for themselves. So I guess you could say that Guns and Shooting Online gives this AMJ Pacific hunting cap three thumbs up!